One of the best ways of supporting the work being done by INA right now is by becoming a member. Join online today. Here are some other ways you can assist INA in its work. Want to help INA protect the world’s greatest museum…under water? Donate to INA today and help students, archaeologists, and scholars as they excavate, study, and preserve our shared human history. …to excavate a 7th-century B.C. Phoenician wreck? In 2009 it took approximately $110,000 to bring in students and volunteers to do the work in the field (no one receives a salary, but we transport them to the site, feed, and house them), boat hire and fuel costs, equipment, and insurance. Half of the budget came from sponsorships and grants, and the other half came from private donations and support from INA directors, members, and other friends. 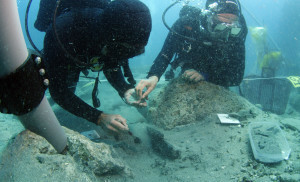 …to work on a nautical archaeological time capsule? For $3,000, we can offer a student the opportunity to travel to the Vasa Museum in Stockholm and spend the entire summer studying and documenting the hull and collections of the Swedish warship Vasa – a perfectly preserved time capsule of sailing technology and craftsmanship from 1628. Adding the results of a project’s field season to the growing body of work on the INA website, making it accessible to a worldwide audience online, costs $300 – $1500 to develop, organize and enter data, create photo and video galleries, and add internal and external content links. … to publish the results of discovery? Every INA project begins with the dream of finding a shipwreck. 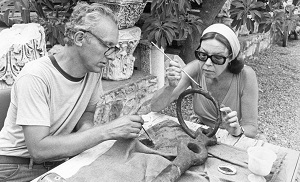 For over forty years our dream has been the recovery, analysis, and preservation of these priceless remnants of human history. Each with its own story to tell–a story that can enrich our view of the past and even expand the way we understand history. SURVEY the seabed using a range of technologies. EXCAVATE both underwater and in ancient landfill. ANALYZE using cutting edge forensic techniques. MAP with everything from pencils to lasers. PRESERVE to reverse the effects of centuries buried in water, sand, and mud. SHARE through articles, reports, lectures, online, film, and other multimedia. Currently, projects being carried out in locations diverse as Albania, Bermuda, Panama, Turkey, Spain, Vietnam, and Canada’s Yukon Territory are revealing new and fascinating stories. In Panama, a survey of the Caribbean coast of the isthmus has revealed more than 500 years of submerged history, including a drowned fort, a forgotten town, and shipwrecks that include what appears to be the flagship of notorious pirate Henry Morgan, which wrecked there in 1671. Off the ancient harbor of Cartagena, Spain, at the foot of a submerged rock known as Bajo de la Campana, lies a cluster of wrecks lost thousands of years ago. One of these wrecks, dating to around 650 B.C., is the first Phoenician ship ever to be excavated. Laden with a cargo that includes ivory elephant tusks, copper ingots, pottery, and amber, it is an amazing site just beginning to yield its secrets. Close to the shores of Vietnam’s fabled Halong Bay, another INA team is mapping the silted over remains of a naval battlefield where Kublai Khan lost a fleet of hundreds of ships to Vietnamese defenders in 1288. Buried beneath the mud, the lost ships of the Khan are a unique window into the past and the largest possible collection of medieval Asian shipwrecks. A world away in Canada’s Yukon, the Klondike Gold Rush is coming to life through the study of the paddle wheelers and steamers that plied the rivers carrying men, supplies, and gold fever into the North. 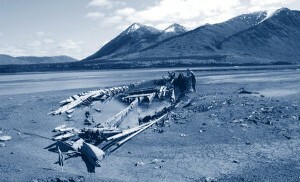 In 2009, an INA team discovered the completely untouched wreck of a small Gold Rush steamer, A.J. Goddard, with the tools and boots of the crew still scattered on the decks on the bottom of a sub-Arctic lake. The discovery of Goddard was hailed as one of the top ten discoveries of 2009 by the National Geographic Society. These are only a few of the incredible discoveries and stories from around the globe that wait to be uncovered. There are many more discoveries that can be made, but time is running out. Deep sea trawling, dredging, looting, and treasure hunting are waging an unparalleled assault on the submerged past. Only INA stands as a global organization dedicated to finding and saving the sites that will make a difference in our understanding and appreciating humanity’s past. INA receives many requests for help and guidance with investigating sites that range from shipwrecks to sunken cities. We respond whenever possible, but without your financial support these precious fragments of human history will remain lost; their stories untold…their voices silenced. Donations to help support INA projects can be made online. The INA Foundation Board manages endowments that help fund different aspects of INA’s work, including student scholarships, archaeology and fieldwork grants, INA’s research vessel Virazon II, and the Bodrum Research Center. Donors interested in enhancing INA’s work through a gift to the INA Foundation have several funding opportunities. 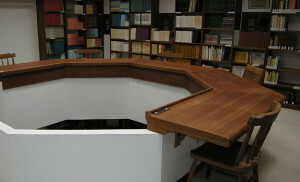 The Tooze Library is staffed by a full-time librarian and is home to more than 10,000 archaeological books and journals including the Dorothy and Homer Thompson Library, making it one of the finest research libraries in Turkey. Your everyday purchases can help support INA! 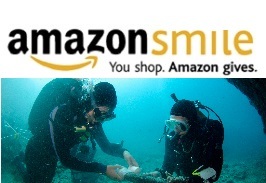 Visit Smile.Amazon.com or Tobi.com and a donation to INA will be made with every purchase. Tobi.com is a clothing and accessory retailer use the link INA Tobi when you shop and the company will donate 1% of your eligible purchases to INA! Customers also receive 50% off their first order.